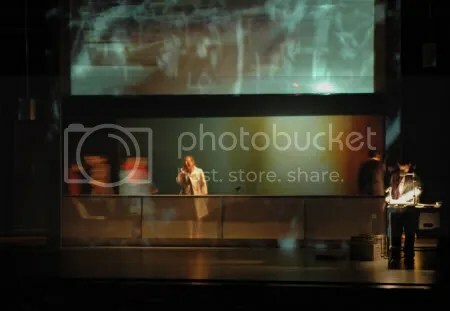 Theatre: Just got back from the Warwick Arts Centre, a play that left us feeling stunned- such was its brilliance. Complicite is the company that put it on, a play of their own devising. The play probably had roots in Brecht, the stage was more high-tech, but some of the style was there. Acting was seamless, as was the whole production. You can forget you are watching a play, forget the passage of time and feel a profound immersion in the presentation. Scene changes were seamless, and the production was almost chorographed blending in dance with stage acting over sound collage (and video too). The sensation of escapism that I get from listening to music and more from painting was there this evening. I came out thinking that nights out at the theatre are the way to go, it beats the fatal misgivings that I have with cinema so often. There have been too many occasions where I have left a film feeling depressingly dissappointed. Further; I have never been for a night out at Warwick Arts Centre and not been stunned by the show! What’s on next week then?